(Italiano Sotto) Creative People in Florence is extremely excited to announce The Creative Collective, a new initiative designed in collaboration with CPiF’s co-founder *Sara Amrhein. The objective of The Creative Collective is to showcase the work of our talented members by giving them a space to show their work to the public. This new project will be organized in the newly redesigned studio of Sara Amrhein where we will be dedicating a portion of the space to a featured member each month. There will be an opening reception where the public will be invited to view the work and meet the artist or designer in person. The Creative Collective will host a series of events aimed to promote the best of contemporary art, design, and fashion featuring Florence’s finest independent artists and designers by choosing the very best the city has to offer. 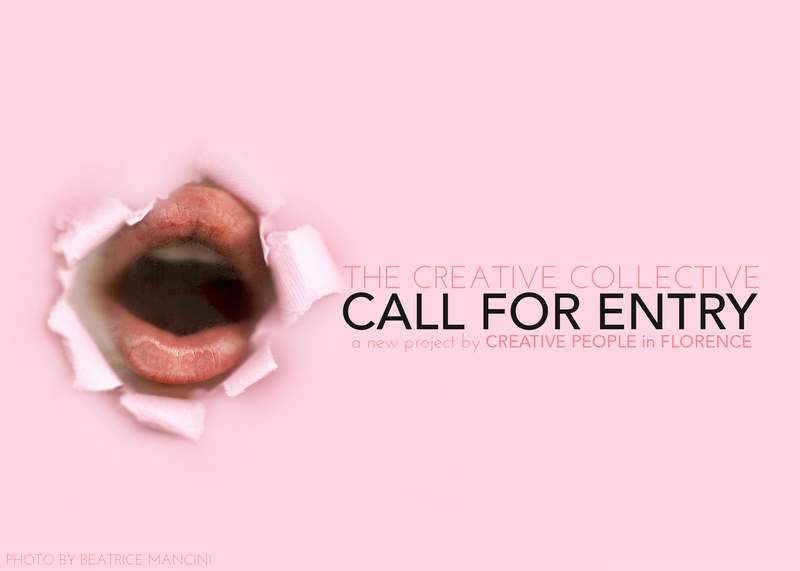 CPiF is officially announcing a ‘Call for Entry’ to have your work included in this new project. The artists will be chosen through a selection process by Sara Amrhein and Anna Rose, the founders and directors of Creative People in Florence. Categories include: painting, sculpture, video, photography, projection, installation, clothing, shoes, jewelry, accessories, graphic design, visual merchandising. If you work in another medium and are unsure about your eligibility, please contact us for clarification. Exceptions will be made for work that is a good fit. Performance can be considered on a case by case basis and will be dependent on the space limitations and nature of the performance. While Creative People in Florence strongly values all types of art and creativity, the purpose of The Creative Collective is to promote and show contemporary works of art and design. We are looking for innovative ideas and thought provoking work based on contemporary concepts and themes. We understand that historical methods of art making are an incredibly important part of our city, however, our mission is to show the other side of Florence and the new work that is being developed here. This may include traditional techniques that are being used in new and exciting ways. Most importantly work will be considered based on theories and original ideas. Please send a minimum of 5 photos but no more than 10 of your most recent work or collection or your current lookbook, or a link to your website or online portfolio. Photos should not exceed 350 KB/JPG and should show all work/designs in their finished form. For fashion designers please show pieces on a model or dress form. Please include a short (100 word or less) description of the work/collection and the concept or inspiration behind it. There is no cost to apply, however, there will be a €150 installation fee and the one month duration of the show + 30% commission of all sales for the duration of the exhibition. For work that is not for sale, there will be a €250 installation fee and the one month duration of the show. Extensive publicity through all Creative People in Florence social media, a spotlight feature on the CPiF blog + inclusion in our newsletter, installation of the work, opening reception, CPiF cultural association fee, and inclusion in the newly designed CPiF directory of artists and designers in Florence. Please send all applications to: creativepeopleinflorence@gmail.com. *All artists are invited to install their show in the manner in which they would like their work to be presented, however, changes to installation and display will be made as seen fit or on a need basis. All work should be ready to hang or display in its necessary form. For fashion designers you will need to supply matching hangers for your collection. For installation art and visual merchandising, the artist will be given complete control of how work will be shown. Please contact Sara Amrhein or Anna Rose with any questions. Creative People in Florence è estremamente lieta di annunciare The Creative Collective, una nuova iniziativa progettata in collaborazione con la co-fondatrice di CPiF Sara Amrhein. L’obiettivo di The Creative Collective è quello di mostrare le opere dei nostri membri di talento, dando loro uno spazio per mostrare le opere al pubblico. Questo nuovo progetto sarà organizzato nello studio recentemente ri-progettato di Sara Amrhein dove dedicheremo una parte dello spazio ad un membro di funzionalità ogni mese. Ci sarà un inaugurazione di apertura in cui il pubblico sarà invitato a vedere il lavoro e incontrare l’artista o designer in persona. The Creative Collective ospiterà una serie di eventi volti a promuovere il meglio dell’arte contemporanea, del design, della moda e con i migliori artisti e designer indipendenti di Firenze, scegliendo il meglio che la città ha da offrire. CPIF annuncia ufficialmente un ‘Call for Entry’ ed avere il vostro lavoro incluso in questo nuovo progetto. Gli artisti saranno scelti attraverso un processo di selezione da parte di Sara Amrhein e Anna Rose, le fondatrici e direttrici di Creative People in Florence. Le categorie includono: pittura, scultura, video, fotografia, proiezione, installazione, abbigliamento, scarpe, gioielli, accessori, design grafico, visual merchandising. Se si lavora in un altra categoria e non siete sicuri della vostra idoneità, non esitate a contattarci per chiarimenti. Le prestazioni possono essere considerate caso per caso e dipenderà da limitazioni di spazio e natura della prestazione. Si prega di inviare un minimo di 5 foto, ma non oltre il 10 del vostro lavoro più recente o la collezione o il vostro lookbook corrente. Le foto non devono superare i 350 KB / JPG e dovrebbero mostrare tutti i lavori / i disegni nella loro forma finale. Per gli stilisti si prega di mostrare pezzi su un manichino o un modello. Si prega di includere una breve (100 parole o meno) descrizione dell’opera / collezione e il concetto o l’ispirazione dietro di esso. Non ci sono costi di applicazione, però, ci sarà un pagamento di €150 di installazione e la durata di un mese della mostra + 30% di commissione di tutte le vendite per la durata della mostra. Per il lavoro che non è in vendita, ci sarà un pagamento di €250 di installazione e la durata di un mese della mostra. Ampia pubblicità attraverso tutti i Creative People in Florence social media, un spotlight sul blog CPIF + inclusione nella nostra newsletter, l’installazione del lavoro, l’inaugurazione del evento, CPIF tessera di associazione culturale, e l’inclusione nella rubrica CPIF nuova concezione di artisti e designer in Firenze. * Sara Amrhein e Anna Rose sono responsabile per l’aspetto generale e finale dello show. Modifiche a installazione e l’esposizione saranno effettuati come forma visto. Tutto il lavoro dovrebbe essere pronto ad appendere o visualizzare nella sua forma necessaria. Per i designer di moda è necessario per la fornitura di ganci tutti uguali. Per l’arte l’installazione e visual merchandising, all’artista sarà dato il controllo completo di come verrà mostrato il lavoro.